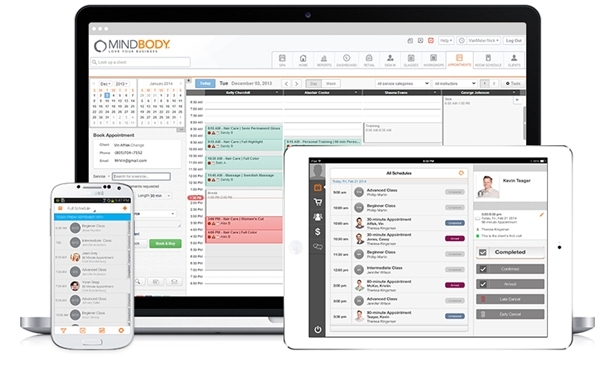 San Luis Obispo, CA – July 24, 2015 – MINDBODY, the leading cloud-based business management software and payments platform for the wellness services industry, has released Class Check-in by MINDBODY®, a new mobile application designed to simplify the class check-in process and improve the overall customer and front desk staff experiences for class-based wellness businesses. The flow of customer arrivals for a class or session can sometimes result in crowded rooms and lines, negatively impacting the customer experience and taking valuable time and attention from both instructors and staff at the front desk. Class Check-in by MINDBODY® facilitates a more streamlined arrival experience by allowing for easy self check-in. The mobile application, available now in the iTunes App Store, works on the Apple iPad and can be stationed at common class check-in points throughout a business such as the front desk or directly outside classrooms. Customers can also see how many classes or visits they have left on their account or in their package so they know when it's time to renew. By encouraging easy self check-in, Class Check-in by MINDBODY® frees up time for front desk staff and instructors. Front desk staff members can focus on ringing up transactions, helping customers that are coming out of previous classes and answering questions related to purchases and accounts. Likewise, instructors are free to prep their rooms and equipment, welcome customers in a more personal way, or wrap up additional responsibilities before class begins. "There are times during the day when we're really busy and we have more than one class happening at once," said Stephanie Stackhouse, owner of SLO Yoga Center. "This app has been great because students can take care of signing themselves in and getting situated, while our front desk can help new students by providing them with information and more attention." MINDBODY is the leading cloud-based business management software and payments platform for the wellness services industry with over 42,000 local business subscribers in 124 countries and territories that provide a variety of wellness services to over 24 million active consumers. MINDBODY's software and payments platform helps business owners in the wellness service industry run, market and build their businesses. MINDBODY also helps consumers more easily evaluate, engage and transact with these businesses, enabling them to live healthier and happier lives. For more information, visit mindbodyonline.com. © 2015 MINDBODY, Inc. All rights reserved. MINDBODY, the Enso logo and Love Your Business are trademarks or registered trademarks of MINDBODY, Inc. in the United States and/or other countries. Other company and product names may be trademarks of the respective companies with which they are associated.